Since we got our Vitamix blender, I've had all sorts of fun experimenting with what kinds of things I can make from scratch (even more than I used to). The latest is fresh peanut butter. 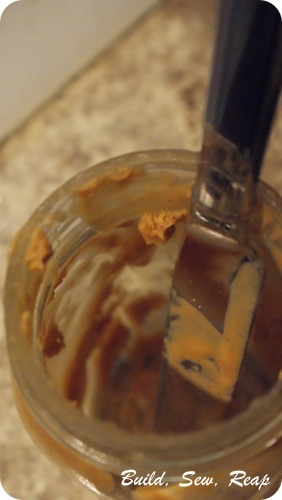 The first version I made was just ground up peanuts with a little honey but it wasn't spreadable. The toddler enjoyed the peanut butter balls I fed him for lunch one day but that was about all that peanut butter was good for. After talking to a friend who told me she adds peanut oil to her homemade peanut butter, I got the idea to add some coconut oil because I'm definitely all over the coconut oil trend right now. The brand I use is from Costco (a huge tub) and it definitely has a flavor to it. I'm sure the peanut butter would still be wonderfully spreadable if you use another brand but I can say without a doubt that the stuff with a little flavor to it made the peanut butter amazingly tasty too. 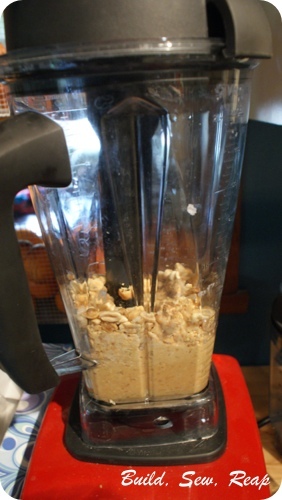 I dumped about 4 cups of roasted peanuts (from the bulk bins at the grocery store) into my blender then added a healthy squirt of honey (probably close to 1/4 of a cup) and a mound of coconut oil (probably around 1/3 to 1/2 of a cup). I blended it until it was creamy and loaded it onto some bread with some of the blackberry jam I made from berries the family picked late last summer. The amount of coconut oil you use will depend on how creamy you want your peanut butter. 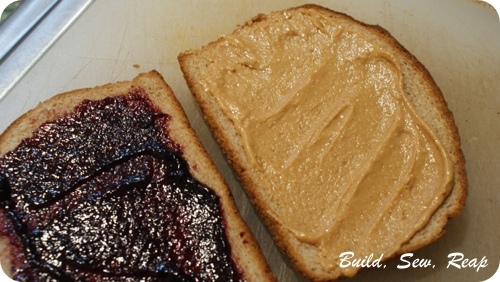 I like it very spreadable although I do tend to have to microwave the PB for a few seconds when I first take it out of the fridge just to soften it up a bit. The coconut has a very low melting temperature though so it doesn't take long. What kind of oil do you use when you make homemade nut butters? I'd love to hear your recipes if you've found something that works well for your family.